In the 5th century B.C. Greek historian Thucydides called Porto Koufo the safest harbor in ancient Greece. 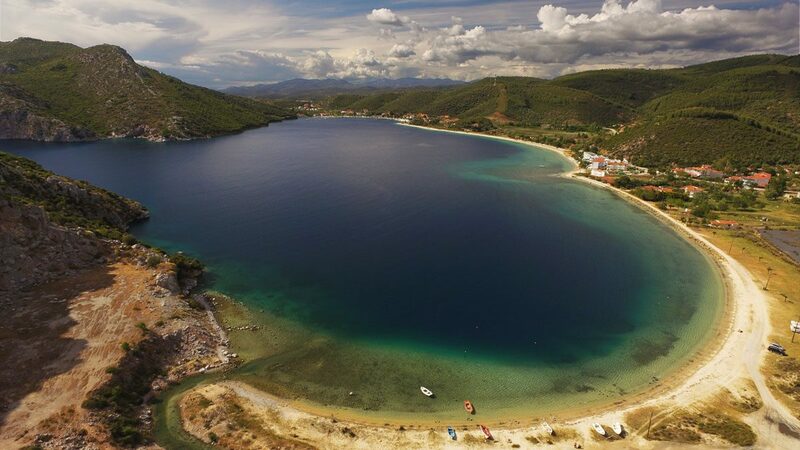 Porto Koufo is surrounded by steep mountains forming a majestic sapphire blue lake that looks more like a fjord. The name, ’deaf harbor’, was given to Porto Koufo since the sea could not be heard from the port. Why go to Porto Koufo? Porto Koufo today has become a haven for sailboats and yachts which are often docked at the small marina. Tourists sailing the Aegean and around Halkidiki can anchor for the night or for some days and find protection in the calm bay of Porto Koufo. Small boats can also be rented in Porto Koufo for fishing or just exploring the Sithonia coastline and perhaps you can even find your own secret beach. The small harbor is also home to many local fishermen who return here each morning to the placid waters of Porto Koufo with their daily catch. During the day you will see many fishing boats tied to the jetty as the fishermen sit on the dock repairing their nets in preparation for the next night at sea. Cycling in Sithonia is becoming more popular every year and Porto Koufo is an ideal part of Sithonia for cycling. If you can’t bring your own then consider renting a mountain bike to explore the isolated southern tip of Sithonia. Cycle through olive groves and dirt roads which eventually turn into rocky paths where cars cannot access. A mountain bike is ideal for reaching some isolated beaches on Sithonia’s southern tip such as Lemos beach. From here you can cycle the many goat paths through the Sithonia mountains and be rewarded with spectacular views. Just east of Porto Koufo towards Kalamitsi, you can challenge yourself by cycling the main Sithonia road up several kilometers of incline and reach the dirt road that winds down to Ambelos beach. The road is washed out in parts so a mountain bike is the best way to reach this inlet. Just be sure to bring along some water as there are no services on Ambelos beach! Porto Koufo is well-known for its seafood tavernas. 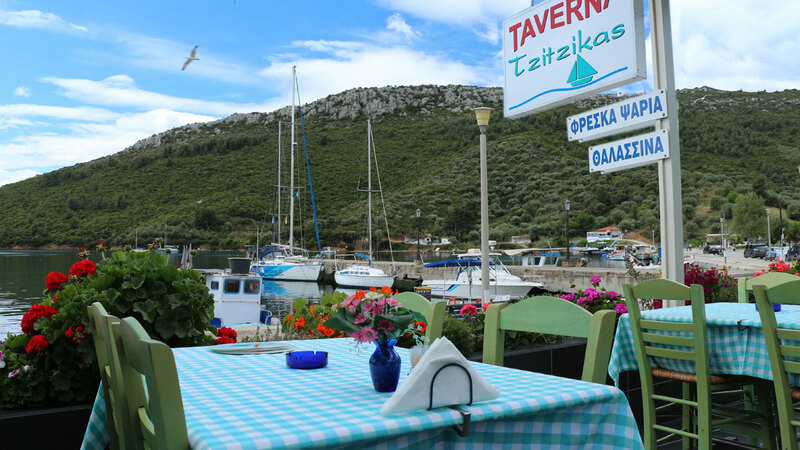 Every evening this cluster of seafood restaurants by the marina fill up with tourists and those arriving from afar to enjoy some of the best seafood in Sithonia. If you don’t book your hotel in Porto Koufo, we highly recommend to make the effort and save an evening for this charming harbor village and come for dinner. In Porto Koufo the sun sets early behind the mountain so don’t expect to experience a great sunset from the marina. The attraction in going to Porto Koufo is its amazing seafood accompanied by the view of floating sailboats with their perfectly still reflections in the serene water… postcard worthy to say the least! Porto Koufo has been hiding people for millennia. This is a great place to lay low for some days and get revitalized. The narrow sand strip beach welcomes you to get sun and its deep water is ideal for taking a refreshing dip. Bring along a fishing rod and sit on the beach as you cast away your problems. A hike up the mountain will reward you with a birds eye view over the fjord and Toroni, here you can also scour through the scattered ruins from ancient Torone. When the waters are calm, a small rental boat will help you discover some isolated beaches a short ride outside the harbor where you can find your escape. 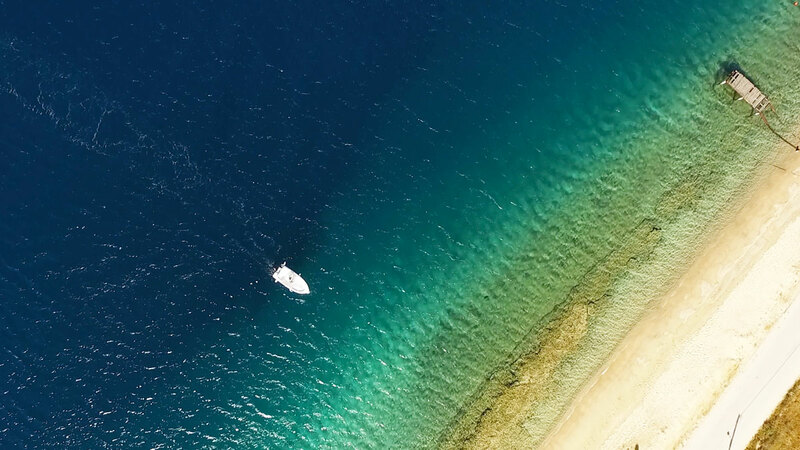 When the waters get rough, Porto Koufo makes the perfect refuge for sailboats and yachts. If it’s adventure you’re looking for, Porto Koufo goes that extra nautical mile. The deep water in the harbor is starting to attract free divers who seem to have discovered the perfect place in Halkidiki for this extreme sport. Perhaps try your skill at deep-sea fishing – in September and October Porto Koufo becomes the northern point of a fishing zone that attracts Bluefin and Yellowfin Tuna. You can also rent a yacht or sailboat and charter a course to anywhere in the Northern Aegean. With endless possibilities for cycling and hiking, Porto Koufo is sure to get you pepped! Toroni with its beach promenade offers restaurant and beach bar options. From here you have easy access to a chain of beaches that are some of Sithonia’s most spectcular – such as Tristinika. Heading east, Kalamitsi is just a 15 minute drive and a good place for restaurants, diving and camping. 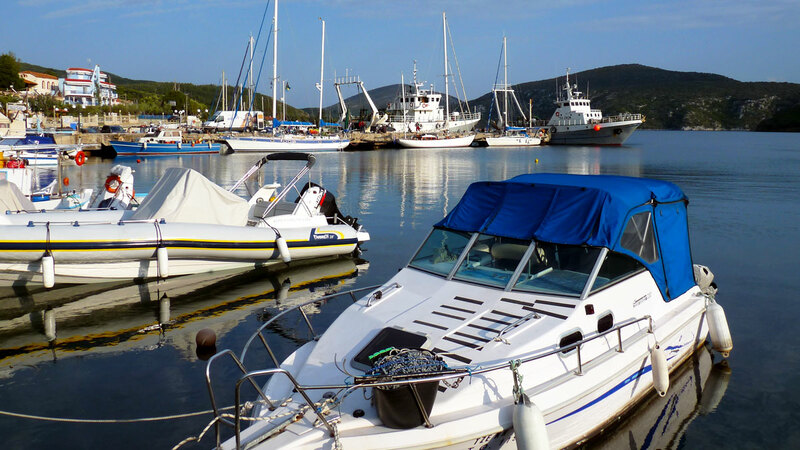 Porto Koufo – Greece’s safest harbor, in our opinion is a safe bet.